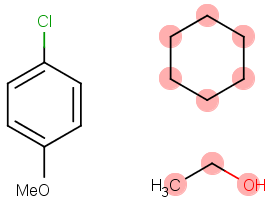 Checker searches for fragments in the molecule file defined as solvent molecules if more than one fragment is present. The solvent list is customizable and is stored in a configuration file. Fixer offers removing solvent fragment(s) (removeatom). In case there are only solvent molecules in the input structure, Solvent Checker detects the solvents but no fixer is offered.